Do buildings dream of electric sheep? In the case of Sanofi, a former pharmaceutical factory in Dagenham, dreams are made of a chorus of singing scientists line-dancing down an assembly line. 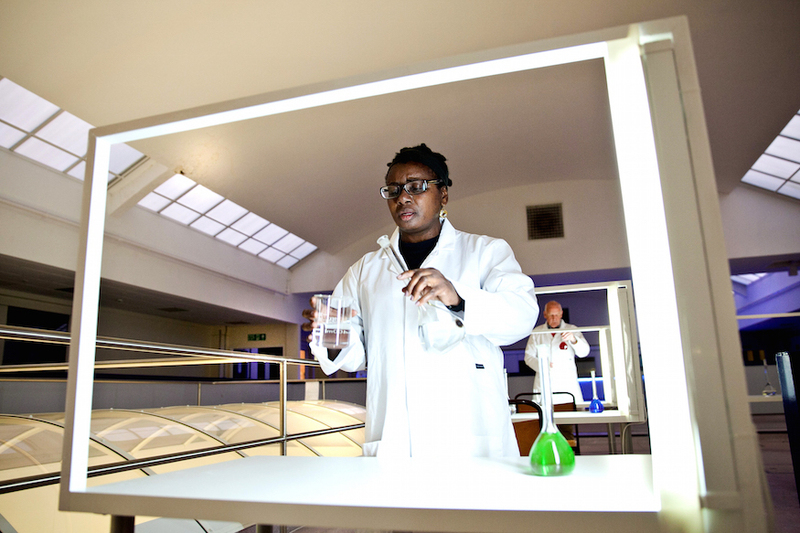 Geraldine Pilgrim is known for productions that transform buildings and landscapes, and her new immersive show Well takes us on a journey tracing the development of modern medicine — and Dagenham's crucial role within that history. In 2013, the Sanofi factory closed its doors for the last time causing the loss of 450 jobs. This production explores the site as a place of potential through a series of scenes which breathe life into the now defunct chemical machinery. The borough of Barking and Dagenham was voted worst to live in according to a recent RightMove survey, yet Pilgrim's production arrives as the area is on the brink of change with hope hinged on a regeneration scheme by Londoneast-uk. As we travel through a maze of stairwells, corridors, waiting rooms and areas for making, packaging and storing chemicals, the smell of its former use lingers in the nose. Pilgrim understands how memories become embedded in the places we inhabit. She expertly teases them out of the walls and offers them to us in glimpses. We share private moments with patients, sympathise with a sleeping cleaner and a bored receptionist. Yet the audience is left wondering which secrets Pilgrim has left locked behind closed doors and health and safety tape. With a cast made up of former employees we want to hear more of their stories, yet the cast are strangely silent, so absorbed in their work they seemed disconnected from those around them. The building is brought to life by the sound recordings of former employees recounting their memories which echo along the corridors. Pilgrim’s attention to set detail is impeccable: pills tumble from the ceiling and collect on the floor like the fallen prospects of those who were made redundant. The repetitive nature of factory work is echoed by the looping form of the production which repeats every half an hour for groups of 12. Most poignant of all was a lady who sat in a hospital bed sewing a lifeline onto fabric so it looked like a monitor screen. But just as memories can be stitched into buildings, they can also unravel with the destruction of those sites. When we asked for directions, many people hadn't heard of the Sanofi site, which only exemplifies the need for Well to tell this narrative. Well is on at the Sanofi factory in Dagenham East until 6 September (follow the yellow signs for Well painted on the floor when you leave the station). It is commissioned by Creative Barking and Dagenham a community project aiming to bring creativity to the borough. Tickets are £3.50-£9 (with concessions available for Barking and Dagenham residents). Londonist saw this show on a complimentary ticket.